getcalc.com's n CHOOSE r (nCr) calculator, formula, examples & workout to estimate total number of all possible combinations of events to occur in statistical experiments, where the events order is not important. Users may use the various input values to verify or calculate the total number of possible combinations, or to generate the complete work with step by step calculation to assist grade school students to solve different nCr worksheet problems by using this combinations calculator. What is Combinations (nCr) & its Application? Combinations is a mathematical function or method used in the context of probability & statistics to represents the possibility of total number elements in a sample space or all possible events occur in statistical experiments where the order of elements or events is not important. It's also one of the most widely used functions in statistics & probability to find the total sample space elements or the total number of possibilities. The partial outcomes of sample space or the order of elements AB & BA are same in combinations and counted as a single combination, for taking 2 objects from 3 distinct objects A, B & C at a time. Therefore the order is not important in nCr. Whereas, the order of elements AB & BA are considered two different events in predicting nPr Permutations. The number of combinations for r objects from n distinct objects is denoted by nCr, nCr, nCk, nCk or n CHOOSE r. For example, 5C2 or 5C2 or 5 CHOOSE 2 denotes the total possible combinations of 2 objects taken at a time from group of 5 distinct objects. Use this Combination (nCr) calculator to find the total possible ways to choose r objects from n objects, at a time to estimate the total possible outcomes of sample space in probability & statistics surveys or experiments, where the events order is not important. The below formula is the mathematical representation for choosing the combinations nCr or n CHOOSE r in statistics & probability functions. 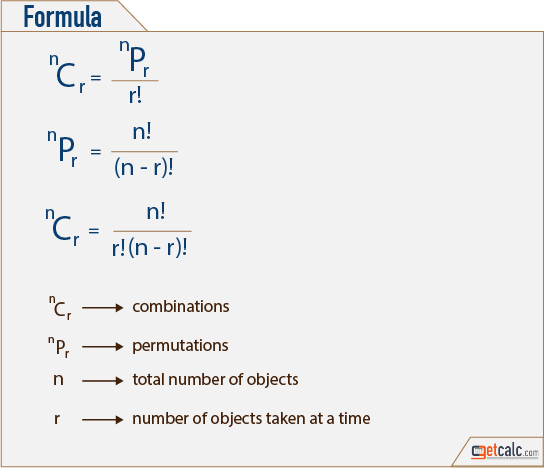 Supply the total number objects and choose how many number of objects taken at a time in the below formula or use the calculator to find the total number of combinations in statistical experiments, where the order is not important. By using this n CHOOSE r (nCr) calculator, users or grade school students may generate work with step by step calculation for every set of valid input values used in this calculator to solve the example or worksheet problems. The below are the solved examples to find the combinations. User may change the input values to generate the complete work with step by step calculation to solve similar nCr problems.